Due to the weather, we did not worship together at St. Timothy Lutheran Church this past Sunday, 1/20. However, my sermon was done and if we had met, this would have been what God's people would have heard. The text was John 2:1-11. As I said in my e-ministry reflection this week, Middle Eastern people know how to party. Customs today among the Arab population of Palestine are much as they were among the Jewish people in Jesus’ day. Today a feast should last around three days. In first century Palestine, however, wedding feasts lasted around seven days. That meant a lot of food and drink was needed. One can’t very well have a party with nothing to drink! There was certainly no clean water to be drunk. Wine was the common drink at the table for everyone at that time. Right out of the gate, John lets his readers know that something special will be happening. It’s a time for miracles. This wedding happened on the third day. There is only one other time in John’s gospel that he uses these words and that’s at Jesus’ resurrection. Early Christians could not hear the phrase “the third day” without thinking of the resurrection. In John’s gospel, Mary is never called by name. She is only “the mother of Jesus.” But what a role this simple, ordinary woman plays. Jesus’ mother makes sure Jesus knows that they’ve run out of wine. For us, that would be no big deal. Someone could just run to the store and get some drinks. But at that time, it was a huge deal. To run out of wine, to fail to provide adequately for guests would involve social disgrace. This error would never be forgotten and would haunt the newlyweds all their life. Don’t you think Jesus sounds a bit rude to his mother? For one thing, addressing her as “woman” sounds odd to our ears and then responding “what concern is that to you and to me?” It sounds like “This isn’t my problem. Go away. You bother me.” But in the Greek of the New Testament, the meaning is much softer. Since Jesus was an adult and no longer a little boy, it was most appropriate for him to refrain from calling her “mother.” He was no longer under her authority. Secondly, the rest of the phrase was a way to distance himself from his family. Now that Jesus was about his mission, he had to only follow the directions and timing of his Father. Jesus was living a new pattern timed by the purposes of God. Jesus’ mother speaks from the world of earthly concerns, while Jesus “comes from above” (3:7, 31; 8:23), representing a different order of existence. Now the funny thing is, unlike the other three gospels, throughout John, we find this pattern where someone brings a need to Jesus, he waits before doing anything about it, then ultimately, at the right time responds. We see this in the example of the death of Lazarus when he did not go immediately to Bethany when he heard that Lazarus was very sick. God does not do things in halfway measures. Can you imagine 6 large stone jars that could hold 20-30 gallons apiece? These jars were filled to the brim with ordinary, yukky water that became some very fine wine. This is an extravagant, fabulous amount of wine—unheard of in a poor village family celebration. It is reminiscent of the extravagance anticipated in the messianic days of salvation. At no point does the narrator tell the reader that Jesus has turned the water into wine. The steward knows he is sampling good wine but doesn’t know where it came from. The servants know where it came from, but don’t know that it is wine, at least not from their own experience. It is suggested that the disciples knew. As the “first of his signs,” (v. 11), the Cana miracle points ahead toward the unfolding story. It is but the beginning of a ministry accompanied by supernatural power. This was such a convincing miracle that the disciples believed. This sign shattered the boundaries of the disciples’ conventional world and they were willing to entertain that this boundary-breaking marks the in-breaking of God. It helped to confirm that Jesus must be the Messiah. In a way, we are warned that this gospel doesn’t play by the rules of our expectations. Neither does God. The problem with humanity is that we are good at finding and proclaiming scarcity. Jesus sees what we do not—plenty of wine! The transformation of water into wine isn’t for the water or wine’s sake, but for the sake of the kingdom of God—for God’s glory and for those friends and neighbors at the party (Rob Myallis). In this story, what was used to meet the need of the bride and groom and their guests? None other than ordinary people and ordinary elements—a steward, servants, a mother, stone jars and water. Jesus took these things and more than abundantly met the needs of the hosts and guests. His ministry began with an extraordinary act of grace, a first glimpse of the “greater things” to come (John 1:50). 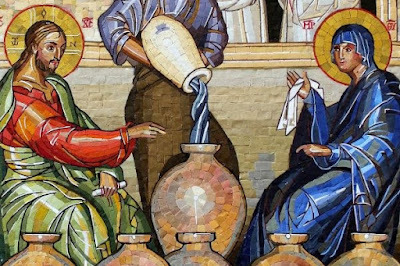 We have seen God’s generosity in Cana, but if God is so miraculously generous, then why are so many left without clean water, safety, education and healthcare? Are we to be the servants through which God’s abundance flows? Are we to be like Mary, constantly voicing the concerns of the people to God in confidence that God will make it right? How can we ordinary people share God’s love and meet the needs of those around us? Do you have 45 minutes, once a month that you can spare? Can you stand and put one object in a plastic bag? Can you have a good time visiting with your neighbors and friends old and new while you do this? That’s all it takes to help with packing for the 5 and 2 Ministry. It’s so simple but helps to feed hungry children, fighting childhood hunger one child at a time. A General Collection Project where our church would collect the suggested items from their bulletin insert, which we will include at a later time. A Mother's Love Project where our congregation collects baby items for new mothers. White as Snow Project where we would collect toiletries and cleaning products. Hands and Feet Ministry where we serve our neighbors and volunteer as individuals or as a team to assist with the various needs a neighbor may have. Bed of Hope Project where our congregation collects bedding items. These are but two of the many examples of ministries with which we may be involved. We don’t need to have any special skills or training. All we have to do is have open hearts and ears to hear whatever Jesus is telling us to do and then do it! If you’d rather reach out some other way on your own, simply share a meal with someone. This can communicate so very much. We all have neighbors with whom we could share Chris’s love in this way. Jesus’ first sign at Cana is a reminder that caring for guests over meals is no insignificant task. Try having a meal with someone new this week and see what happens. In a few minutes, we will be sharing a meal together. Ordinary bread and wine become the body and blood of our Lord and Savior Jesus Christ. As we come together, we are together the body of Christ. All the saints of God from all time rejoice with us as we partake of this sacred meal of bread and wine, the family meal of Christ’s church. May God use us to spread God's lavishly generous love, supply and care to all our world.